Traffic problems were choking his community, but County Leader of the Year Tarrant County, Texas, Judge Glen Whitley created a path that overcame years of conflicting interests. Almost everyone in Tarrant County, Texas, associates County Judge B. Glen Whitley with his success in bringing together the diverse forces in North Texas to make possible the $2.4 billion North Tarrant Express, a public/private partnership that is expected to transform transportation in the North Texas area. But, Whitley says that the community response to the Hurricane Katrina disaster is a better indicator of his philosophy of governing. 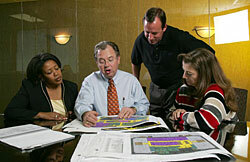 Marshaling forces to meet the broad needs of the community is a central tenet of Whitley’s philosophy. 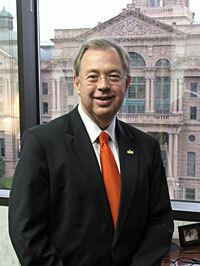 Since he was elected to his first four-year term as County Judge in Tarrant County in 2006, his extraordinary ability to unite the often colliding political forces in a burgeoning North Texas region has brought him accolades for achievements that had eluded his predecessors for decades, especially the transformational North Tarrant Express project. 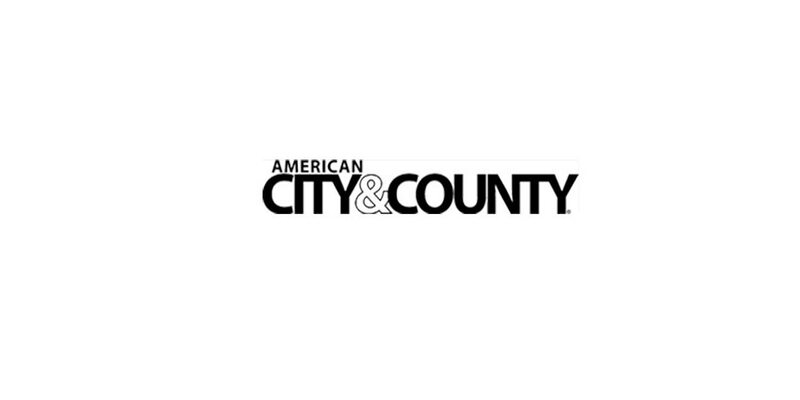 For his visionary leadership and his ability to unite otherwise warring parties to better the Fort Worth region, American City and County has named Whitley its County Leader of the Year in 2010. For many leaders in the area, Whitley’s role in finding a financial solution that has given life to the North Tarrant Express is a signal achievement that alone merits his accolade. Others cite his achievements in a variety of initiatives, ranging from an overhaul of the mental health system to resolving small inter-departmental issues that hinder government productivity. No project owes more of its progress to Whitley than the North Tarrant Express, parts of which had been on the books for 30 years before leaders finally assembled funding to allow the massive highway expansion and reconstruction initiative to break ground. While a broad consensus had concluded that the choked transportation system had to be revamped, no one could work out a politically acceptable means to pay for it. Whitley knew that leaders for a generation had pushed the idea of the North Tarrant Express as a vital piece of infrastructure to feed the economic engine in the North Texas area. The Metroplex, which also includes Dallas and Arlington, is the nation’s fourth-largest region with 6.5 million people and is expected to grow by another 1 million people every decade until 2040. Motorists and businesses alike complain about clogged roads, a situation that threatens economic development. Whitley’s North Tarrant Express plan involved obtaining private sector funds to supplement public participation to cover the $2.4 billion cost. Moreover, the proposal meets the complaints of conservative Texas voters who resisted the idea of paying tolls on top of taxes by combining expanded free lanes with new managed lanes. Motorists who want to pay for faster travel can jump on managed toll lanes, while cost-conscious motorists can drive on the free lanes. A Spanish company won the bid for the project, agreeing to cover two-thirds of the construction cost while receiving the revenue from the managed lanes in return. Whitley came to politics after building a highly successful accounting practice in the Fort Worth and Dallas area. He was elected Tarrant County commissioner in 1996, representing the northeast portion of the county, and then Tarrant County judge in 2006, which in Texas serves as the county executive and presides over the Tarrant County Commissioners Court. He is unopposed for re-election in November for a second, four-year term. He believes part of the solution can be found in local option transportation bond issues, which he strongly, but unsuccessfully, lobbied for in the state legislature. He promises he will be back in the next legislature to gain passage of the funding mechanism, which he believes is targeted enough to avoid the “big government” label. “We have to go back and convince folks that transportation is a problem, and the legislature needs to fix it,” he says. Whitley points to another major transportation issue that is high on his agenda. The so-called Tower 55 is the ground-level intersection of two major railroad lines — the Burlington Northern and the Union Pacific — that is a bottleneck tying up freight traffic, automobiles and commuter lines. “Until this issue is solved, we can’t begin to move forward on commuter rail,” he says, referring to another project on his docket that is critical to his push for better air quality. Instead, he sees government as the agent for marshaling the energy of residents. “It’s not just government,” he says. “It’s faith-based organizations. It’s nonprofits through volunteers. There’s a volunteer spirit throughout the country. The big challenge is finding a way to channel it.” He is particularly proud of efforts to improve mental health and assist the disabled by working with churches. He admits, though, that his biggest asset, his accounting background, is also his biggest fault. “I know I spend too much time in the details,” he says. “My staff tells me to go away: ‘Let us work, and we’ll bring it back to you,'” he says. Robert Barkin is a Bethesda, Md-based freelance writer.